Biafra was the scene of one of Africa's bloodiest wars. "Biafra" was the taunt German children used for skinny kids in the late 60s - the term was synonymous with starvation. It is now 40 years since the end of the Biafra war, and Nigeria's future still hangs in the balance." The 60s were an exciting time for Africa as Ghana, Kenya, Cameroon, Tanzania, Nigeria and many other newly independent countries looked forward to self-determination. This soon changed for the most populous country, which went to war in 1967, when the southeastern province of Biafra declared independence from Nigeria. 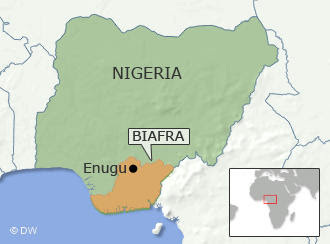 The southeast, inhabited by members of the Igbo tribe, was the most densely populated region of Nigeria, so the Igbos were "the biggest diaspora of any group in Nigeria and had migrated to every crack and nook of Nigeria," Dr. Johannes Harnischfeger, author of "Democratization and Islamic Law: the Sharia conflict in Nigeria," told Deutsche Welle. Biafra's declaration of independence led to backlashes against Igbos in the rest of the country. This in turn triggered reprisals against other ethnic groups in Biafra. During the war, the Nigerian federal government had the support of Great Britain and the Soviet Union while Biafra was only recognized by four African countries, the Vatican, and the World of Council of Churches. Leading expert on Nigeria, Dr. Axel Harneit-Sievers, told Deutsche Welle that "the US and Germany's neutral stance was a de facto support for the Nigerian federal government given the military and humanitarian situation." At one point in the war, Nigeria did not allow any humanitarian aid into Biafra. Later, medical aid was allowed into the region, but food was not. The Biafra War ended on January 15 1970, leaving over one million people dead. After the war, Nigeria was divided into 36 states to try and minimize ethnic tension. However, any attempt to separate religion and ethnicity in Nigeria is fraught with problems. So even though the country experienced a wave of optimism and rapid development as a result of the 70s oil boom, many Igbos were still bitter. According to Harneit-Sievers, "ethnic competition plays a bigger role than religion on the national level. None of the three large ethnic groups (Yoruba, Hausa and Igbo) has more than 30 percent of the overall population, so it is always necessary for someone who wants to become president of Nigeria to forge regional ethnic coalitions to get support." In May 1999, the Yoruba military leader Olusegun Obasanjo was elected president in part because he was able to get 70 percent of Igbo support. According to Harnischfeger, the Igbos who had focused on democracy were soon disappointed with the government because they were underrepresented. As a result, the Movement for the Actualization of the Sovereign State of Biafra (MASSOB) was founded in September 1999. A good number of Igbos are sympathetic to MASSOB, and the party has a lot of support from the young who did not experience the war. The growing support of MASSOB among the Igbo youth illustrates how they feel disenfranchised as a result of their ethnicity. However, northerners (mostly Hausa-Fulani) perceive any political differences with the government or the South as religious. Most of them are Muslim and suspicious of the government. In 2000, the implementation of Sharia Law in Kaduna State led to clashes between Muslims and Christians that left more than 2,000 dead. The 2002 Miss World Pageant also led to clashes between the two religions when journalist Isioma Daniel suggested that the prophet Muhammad would have married one of the competitors in a newspaper article. Furthermore, events in other countries have an impact on the relationship between Christians and Muslims in Nigeria. Harneit-Sievers said one example was "the publication of the Muslim caricature in a Danish newspaper that also led to protests in Northern Nigeria." He added that such events "may translate into conflict and perhaps even counter attacks against Muslims in the South." Today, the bigger issue facing Nigeria is the health of President Umaru Yar'Adua. Both Harnischfeger and Harneit-Sievers agree that this poses a problem. It is hard to say whether the President who was nicknamed "Baba go slow" brought many changes to the country, but he can be credited for the disarmament process in the Niger Delta, said Harneit-Sievers. This program is currently in danger as a result of his health, and the uncertainty surrounding who is actually ruling the country. The recent protests in Abuja shows that "the criticism is rising and it could end with a situation which would make it necessary to have a new president, which poses its own problems because questions of ethnic balancing, regional background, power sharing, and so on, are involved," Harneit-Sievers said. The general discontent of the Igbo with the government also makes secession a possibility. Nevertheless, Harnischfeger feels that "it is not an option for the near future though many Igbos are hoping for it." MASSOB has a growing support among the young who believe that a separate state would usher in an era of more opportunities for the oil-rich state. "So, if Nigeria falls apart, then Biafra may become a reality because of Igbo bitterness," he added. However, Harneit-Sievers disagrees with the possiblity of another Biafra secession and says that the support for MASSOB among young Igbos "reflects the desperation of the youth in Nigeria."